Roasting vegetables is one of the best ways to maximize their natural flavors. It’s also my favorite way to eat them. All you need is a baking sheet, an oven, some olive oil and seasoning and you can transform your favorite veggies into a tray of warm, caramelized deliciousness. Roasting intensifies any sweetness that a vegetable naturally has, so Balsamic vinegar is a really good complement to roasted veggies. I chose the vegetables for this recipe based on personal favorites and also to have an array of colors, but you can certainly use other vegetables if you prefer. This recipe would make for a mouth-watering Thanksgiving side dish, but is really simple and delicious for any day of the year. In a large bowl, combine all the vegetables and mix them together. Drizzle the olive oil and vinegar over the vegetables and sprinkle on your desired amount of salt. Toss to coat. 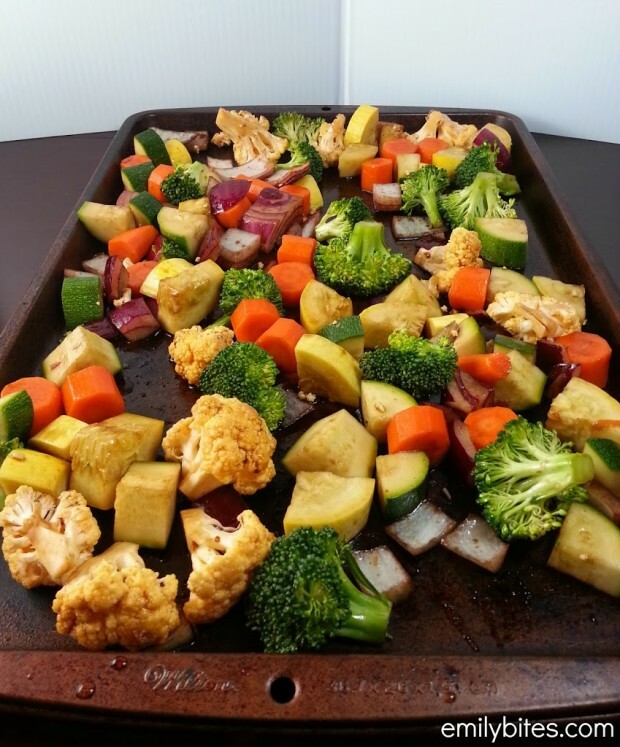 Pour vegetables onto the prepared baking sheet and roast in the oven for about 25 minutes or until caramelized. *The Weight Watchers PointsPlus recipe builder assigns pointsplus values to the vegetables in recipes. If you prefer to count yours as free then each serving is 1 P+ instead of 2. I was just thinking about doing roasted veggies to up my veggie intake and I wasnt quite sure where to start. You have amazing timing! I will be making it this week! 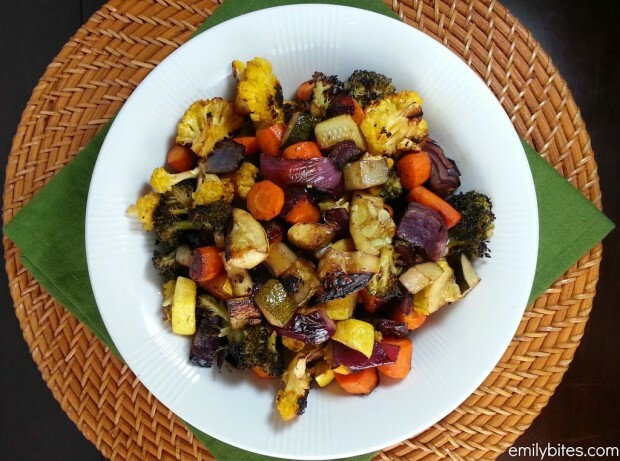 Oven roasting veggies is my favorite way to serve them. Love the addition of balsamic vinegar. Nice addition of the balsamic vinegar. 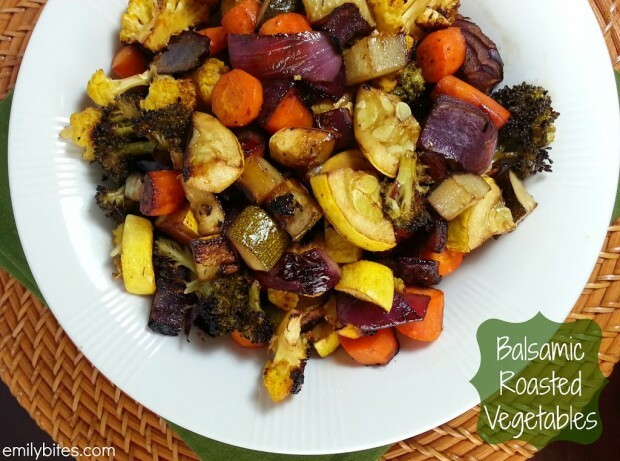 We usually roast all of our veggies this way but I never thought to add that! Emily, can you do this with frozen veggies? This recipe sure looks delish and of course healthy! I will definitely try to cook Balsamic Roasted vegetables as part of my diet plan, I bet this will work for me! I will definitely try this healthy recipe at home. I was advised by my doctor to increase vegetable intake for me to avoid possible health problems, this will definitely part of my healthy diet plan. This is what I need during those nights that I feel lazy to get up and cook. Simple yet healthy without you knowing it. Testing my oven tonight! Thank you but I wanted to know about your remedies with vinegar and etc. This is perfect and simple! I was roasting my vegetables the other day and tried creating a balsamic reduction. Oy! Didn’t go over so well. Equal parts of olive oil and vinegar is easy to remember. Thanks for sharing 🙂 PS Your colorful choice of vegetables is gorg!! I sprinkle a little dried rosemary on them before backing. Love this recipe! I am surprised to see that you cooked zucchini and yellow squash for the same amount of time as carrots, broccoli and cauliflower… weren’t the squash mushy by the time those heartier veggies were done?